In the segment of e-books for a long time to resist the seasonal cycle of updates. Triple undisputed leader, set the tone for the world market, is presenting its new products in strict order: late spring their achievements makes Barnes & Noble, the end of summer is reserved for Sony, and finally in the early autumn of their event spends Amazon. It is natural that each update to the companies tries to prepare something “calamity” that will force owners of previous versions of the reader reach for the wallets. Current 2012 was no exception, in the spring of Barnes & Noble showed interesting NOOK with revolutionary lighting GlowLight, the announcement of the fall of Amazon fans looking forward to the updated Kindle screens with higher resolution and practically confirmed illumination. But the Japanese seem to have decided to take a timeout, presenting an almost complete copy of last year’s Sony Reader PRS-T1. Thus, fans of the brand will have to wait for the next generation of screen E Ink Pearl HD built-in light and at least one year, or to pay attention to more advanced competitors. Sony Reader PRS-T2 comes in a small cardboard box on the design which is easy to guess a specific design option. 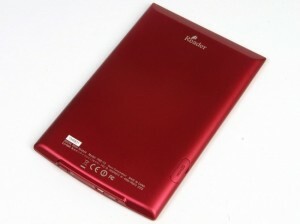 It comes with different colors red reader for fans of classic colors are also available white and black version. Pay special attention to the red and white versions reader finished glossy, and black – matte plastic, so for fans of practical solutions the choice is obvious. Sony Reader PRS-T2 comes with a complete set packed in a tray of cheesy ordinary cardboard. Here you will find a brief instruction manual, cable USB / micro-USB and a plastic stylus with a curved top. This item allows you to attach the stylus to clothing, because the corresponding hole on the reader is not provided. Full charger and cover, if needed you have to purchase it separately. To judge by the content, size and weight, then we have almost the same last year’s Sony Reader PRS-T1, stubbornly defending the title of one of the lightest 6-inch reader in the world. In reality, the popular Amazon Kindle 4 weighs only 6 grams heavier and flexible WEXLER. Flex ONE and do as much as 54 grams lighter than the 164-gram Sony Reader PRS-T2. Only, and is not too successful change in the design was the other registration panel. Stylish metal panel with spindly thin strip of buttons, scratches Sony Reader PRS-T1 was replaced by a set of free-standing plastic buttons, icons in silver finish. Not only do these buttons do not look too demanding (and according to some aesthetes and tasteless and did), so more and no panel-lining visually heavier bottom. 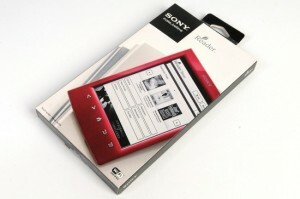 The front panel and top of the side walls of red and white version of the Sony Reader PRS-T2 made of Mark glaring plastic. But the black version was deprived of this dubious decoration, using perhaps not as attractive, but much more practical matte plastic. Basis case of all three color versions, including the bottom of the side walls made of uhvatistogo softtach plastic. Closer to the lateral faces present rounding, and the upper bound is typical sharpened. Top and right sides of Sony Reader PRS-T2 are free housing, at the bottom left side placed a memory card slot MicroSD, covered with non-removable plastic cover in body color. On a special panel on the bottom rendered: a hole to force a reboot, micro-USB connector for charging and data transfer and power button indicator of the reader with the charge. But the standard audio output, and hence the built-in music player present in the previous model disappeared. Thus, compared to its predecessor design Sony Reader PRS-T2 has not changed, but the only noticeable change like not all. But the appearance of a matt black version is welcome, like the gloss is not everything. The Sony Reader PRS-T2 device is thin and light, the case perfectly assembled and balanced, so keep it in the hands of a very nice (special thanks for softtach-coated back). When using the cover of the thrill of Sony Reader PRS-T2 somewhat different, primarily due to significantly increasing the thickness and weight. Few would argue with the fact that the most frequently used in the operation of any reader – is the turning of pages. In the case of the Sony Reader PRS-T2 you can do as a characteristic movement on the touch screen, and with the help of buttons, both ways of their good. Despite claims to the design, in terms of ergonomics of the new solution of the control unit was pretty good. So, moving closer to the screen button allows for more convenient to press them securely hold the reader grip with one hand. Well, in this unique and easily recognizable form to touch each button can easily use them blindly. Moment the deflection of the membrane and its return to the place felt very clear definition of tactile feedback can be the envy of many keyboard. As a result, the buttons at the Sony Reader PRS-T2 tight enough to not press them by accident, but it and light enough not to cause finger fatigue during long reading. Infrared sensor module supports recognition of two touch, which offers a convenient zoom mode “Pinch-to-Zoom”. Full page refresh happens as long as you do not finally decide the required degree of magnification. In text format is fast enough, but the PDF result in severe to wait. The most interesting and useful feature for enthusiasts Sony Reader PRS-T2 is that it runs on Android OS, which is a fairly easy to create custom firmware with significantly improved functionality. The most annoying change in the basic functionality of Sony Reader PRS-T2 is the refusal of embedded audio player. Perhaps in the target markets for the company Sony this opportunity is not used, but in countries to listen to music and audio books with reader – quite a common thing. In other specifications remain the same, Wi-Fi-module is used to the full, with most services and online store Sony Reader Store for home users useless. The new Sony Reader PRS-T2 is based on a standard monochrome 6-inch E Ink Pearl display with a resolution of 800 by 600 pixels and displays up to 16 shades of gray. For those who had hoped to see in the new model from Sony highlighting a la Barnes & Noble GlowLight or better matrix E Ink Pearl HD resolution of 1024 by 768 pixels will have to wait until at least next year. Around the screen reader installed infrared system Clear Touch with support for two simultaneous touches, which provide touch control without compromising image quality. Declared storage capacity of 2 GB of data, in fact, the user can use only 1.35 GB. Many will be enough of this size, but if necessary it’s easy to extend using memory cards MicroSD. Support format standard for readers Sony, this is a standard TXT, and EPUB and common PDF. Charging Time of Sony Reader PRS-T2 from the USB-port of your computer takes only 2.5 hours using AC charger will win another half hour. Just like its predecessor, the new reader is equipped with a built-in battery capacity of 1000 mAh, from which the assurances creators can work for up to two months if the reading half an hour a day and off Wi-Fi-module. Employing wireless module, you’ll reduce the projected battery life of up to 6 weeks. When scrolling one page per second, the battery ends to achieve 30,000 pages (PRS-T1 shall be 14,000 page). It is not clear how the developers managed to achieve a two-fold increase in the autonomy of Sony Reader PRS-T2 compared to its predecessor, equipped with exactly the same battery capacity of 1000 mAh. Objectively evaluate the autonomy of new items in a relatively short time of testing was not possible, the same result will largely depend on usage, so that the company can only believe in the word. In sleep mode, the screen is displayed on the user’s choice: the cover of the last open book screen saver based on one or a group of images or just blank. The main screen in Sony Reader PRS-T2 consists of three main areas. The top line displays the service information on the status of Wi-Fi-module and battery charge, centered all parameters in the active workbook, including the cover, title, author, number of pages and been read the last session of reading. Just below the cover and removed the names of the last four books, and finally at the bottom of the main screen has large icons libraries, online store and partition Reader Store Applications. The library of Sony Reader PRS-T2 can choose to display content in the form of lines or bars, sorting them by date, title, author, file name, or the last activity. If the book is too much, it will be easier to find the desired volume with the search. Folders are not supported, but you can try to organize your digital library with collections or use the capabilities of Evernote. Long tap on the cover of a context menu where you can view the complete information about the book, and also to remove it or, conversely, to protect from accidental deletion. Interface mode reading at Sony Reader PRS-T2 literally Spartan – except part you should just count pages, but not the clock or battery charge. You can turn the pages using the arrow keys or swipe-gesture, a simple touch to the page does not work. The text is aligned to the width of the page, so that even in the absence of translations looks good. By default, a full update occur every 15th page, but in the settings, you can select a forced refresh each page. Holding down the arrow, you can quickly browse through the pages, the final drawing will take place only after you release the key. The settings menu is invoked by pressing the button. The most popular item Fonts allows you to select the font size of 8 options and the type of 7 options. Adjust line spacing is absent. Unfortunately, the test firmware change the font type in the EPUB-file with the Cyrillic alphabet was not possible, though the book is in the same format in English without problems allowed to do this operation. Item more than anything else hides option places the interface in landscape orientation. Section Navigate Page Reader in Sony Reader PRS-T2 allows us to go to the previous page in time, enter a specific page number or use the slider to move to the right place “by eye.” Here, the book is available and a list of chapters. Paragraph Customize View can set the display mode of the page, select the layout of the following: the original one, two or three columns and landscaping. “Speaker” mode is useful when reading the PDF, but for plain text EPUB enough original layout. Item Crop Page allows to adjust to fit your requirements margins, an Ajust View – adjust the contrast of the image, using the presets or manual mode. Handwriting Notes items allow you to make, view and edit handwritten and keyboard notes. Doing this is especially useful with the stylus. So, a word or a long paragraph, you can simply highlight it, write a note, send a quote it in your Facebook or Evernote or look it up on Wikipedia, Google, or on the pages of the same book. In the Applications Interface Sony Reader PRS-T2 placed items Public Library, Browser, Periodicals, all notes, dictionaries, handwritten notes, reminders, Images, General settings and service Evernote and Facebook. The purpose of each of the items is obvious, we note only that the menu Reading can not only find the value of the right word, but also change the number of the preset dictionary. The settings menu is very rich, in his comprehensive study would have to spend a lot of time, but it’s worth it, because it allows adjust almost any setting. About the price of Sony Reader PRS-T2 does not make sense, since it is not a competitive advantage. In the U.S., the cost is $ 129 reader at the time of the announcement, the experience of its predecessor we certainly expect a promotional Christmas decline to $ 99. Recall that subsidized Amazon Kindle 4 nondisconnectable advertising costs at U.S. $ 79, we can find it completely for $ 100, and even comparable in features Amazon Kindle 4 Touch is we only have $ 125. This was all regarding the Sony Reader PRS-T2 which was recently revealed by Sony, if you are thinking to buy this then it will not be a bad idea.